Subaru has proven its talent for building great crossover SUVs and recently the Tribeca replacement 8- seater arrived on the stage based on the design of the VIZIV 7 Concept. The newest SUV in brand’s range is the largest vehicle this brand made ever and Subaru has done a great job with it. 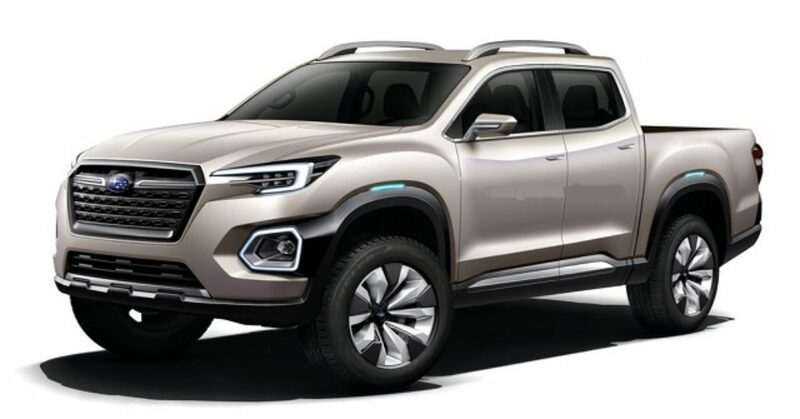 However, when the Viziv-7 appeared and now we have the production version, the speculations emerged about the possible truck version of Subaru’s largest SUV. Subaru already had the Subaru Baja truck, the compact pickup based on the Outback wagon. This model went out from the production in 2006 and since the pickup segment exploited since then Subaru might find new buyers among truck lovers. However, there is no proof coming from Subaru suggesting that this brand is even considering the return to the pickup segment. That isn’t, of course, the barrier to speculate about the possible design of Subaru’s truck if it would appear as the 2019 Subaru Pickup Truck. What’s more, great renderings appeared on the net with the Viziv-7 like styling cues applied on the pickup form and Subaru’s truck would look great. If Subaru would be finishing the pickup truck now, it would likely be based on brand’s largest vehicle ever, the 8-seat Ascent. This three-row SUV was previewed by the VIZIV-7 Concept at the 2016 Los Angeles Show. And now if the 2019 Subaru Pickup Truck arrives it would be another uni-body design in the pickup segment alongside the Pilot-based Honda Ridgeline. With SUV-like underpinning, this truck would provide more comfortable ride than body-on-frame trucks. On the other hand, the styling cues from the recent Ascent and Viziv-7 Concept would also look nice applied to the pickup truck shape. Brand’s grille with winged badge and headlights with C-shaped accents would fit nice to truck’s face. The side body sculpting from the Viziv Concept would also look nice on the pickup truck. When it comes to the interior design, there is no doubt that if Subaru pickup truck appears now, it would have a similar design as the three-row Ascent. The model would have similar dash design and brand’s latest infotainment platform. The truck would have cloth upholstery in the base version and upper grades would add upgraded materials and tech equipment. The truck would also include brand’s EyeSight active safety package. Subaru’s new largest Ascent uses brand’s new turbo-4 engine and it would surely be under the hood of the 2019 Subaru Pickup Truck. This engine makes 260 hp and 277 pound-feet of torque. Subaru combines this engine with the continuously variable transmission system. The standard on the Ascent is also the all-wheel-drive system and model has 8.7 inches of ground clearance. The Ascent can tow up to 5, pounds. The truck version would likely get the strengthened underpinning and higher ground clearance. It would be also capable to tow more than the SUV version. The 2019 Subaru Pickup Truck is just the matter of speculation for now and Subaru hasn’t shown sights of considering the pickup option. However, the model we speculated about would likely have the base price around $30, 000. Too big with poor mileage. Lose turbo. Better yet, BRING BACK the Baja. Loved that truck. Won’t buy this pne. you “lose the turbo” and you get worse economy as it struggles with its payload and performs worse. Why do you think all the modern 2 litre 4 cylinder motors from just about anywhere have one or two turbos? you make it-I’ll buy it…………..been wanting one for sooooooooooo long i have the forester for my wife…I Want A Truck! Would buy the larger Subaru pickup truck today if it were available! Had Baja lono ago. Loved it needed something bigger! Between them going all drive by wire, & the poor dealer service , I’d advice, real sadly, RUN from Subaru these days… Sad, because they used to be so bullet proof. What is release date on the truck?